However if you find this error message really annoying there is now a Windows 7 group policy will turn it off. This is a machine setting so edit a Group Policy Object that is applied to all the workstations you want to turn this message off. Then navigate to Computer Configuration > Policies > Administrative Templates > Network Connections and enabled the “Do not show the “local access only” network icon” policy setting. TADA… Now you will no longer see the exclamation icon on the network icon. 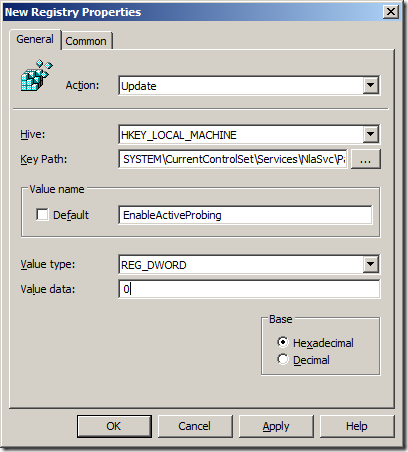 Unfortunately Windows Vista does not have the same Group Policy however there is a registry key that can be applied using Group Policy Preferences that has the same affect. Step 1. Edit a Group Policy Object that is applied to all the workstation you want this Browser Ballot disabled. Step 3. 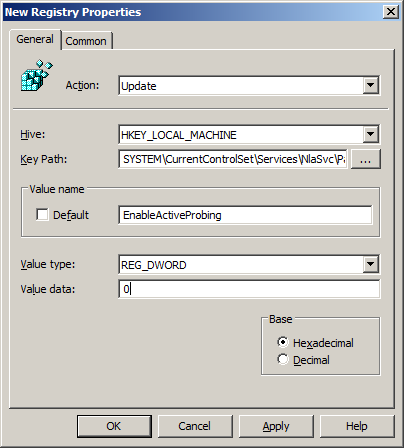 Type “SYSTEM\CurrentControlSet\Services\NlaSvc\Parameters\Internet” in the Key Path then type “EnableActiveProbing” in the Value name, then select REG_DWORD as the value type “0” in the value data and then click “OK”.